License plates* in Japan come in a variety of sizes and colors, with different marking to indicate different information about the car. Today we'll learn about some of the major differences in license plates and what they mean! The four major colors of license plates in Japan are white, yellow, black, and green. 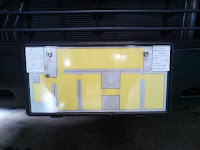 Yellow and white plates are for privately owned vehicles, while black and green are commercial plates. You'll notice, by the way, that the colors used on the commercial vehicle plates are an inversion of the colors used on their private vehicle counterparts. You may have noticed that some license plates in Japan glow. In Japanese, they're called 字光式ナンバー. This is a legal, Land Transport Bureau sanctioned modification which can be requested by drivers at the time of their plates issuance. The issued plates do not illuminate themselves, but rather the numbers are made of translucent plastic; an illuminating device is placed behind the license plate and then usually wired in to activate when the car's headlamps are turned on. Glowing license plates were originally adopted in Hokkaido in 1970 as a way to deal with snow sticking to plates. Rather than today's usage of illuminating LED or EL panels (like in the image here), incandescent bulbs were used. Heat from the bulbs melted snow off the plates and provided an additional benefit of being easier to see at night or in snowstorms. Green translucent numbers are standard on these plates, but blue numbers became available in 2010. Some licensing authorities have also offered glowing plates for kei cars since 2002. "2-series numbers" (that is, 20-29 and 200-298): Vehicles that can carry 11 or more passengers. "3-series numbers": Full-sized cars that can carry fewer than 11 passengers. "5-series numbers": Kei cars or white-plate cars (that would otherwise be 3-series numbers) meeting certain size requirements; less than 4700 mm in length, 1700 mm in width, 2000 mm in height, and engine capacity under 2000 cc. 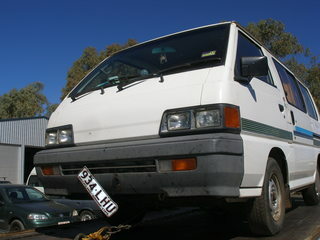 Interestingly, no passenger limit is described for the 5-series numbers, leading some manufacturers to design small buses and vans suitable for as many as 15 passengers (the 1980 Nissan Caravan, for example) yet still eligible for a 5-series number and its accompanying tax classification. "7-series numbers": Formerly a special classification for three-wheeled vehicles, but now merely a continuation of the 5-series line. Cars in public capacities, like police and fire brigade vehicles, use 8-series numbers. Finally, some numbers (the actual vehicle identification numbers, not the vehicle size numbers) are restricted for use on Japanese license plates. Particularly of note are the combinations 42 and 49 at the end of plates, which are homophonically linked to Japanese words for death (死に) and "to run over" (轢く). The full sequences 42-19 (死に行く, "proceeding to death") and 42-56 (死に頃, "time to die") are similarly restricted. Got your interest piqued? Check out our short about the special anti-theft screws holding the rear plate in place, as well. No mention of Y plates? Anon: Thanks for the comment. You mean SOFA plates, right? Good call. Actually, there appears to be a few different letters that SOFA plates can have. Coincidentally, there's at least one other reason for a Japanese plate to have Latin alphabet characters instead of a hiragana character proceeding the plate numbers, that being plates registered in Japan to be legal for international use.